Confused about how to create a zip file (or simply how to zip a file)? Struggling to password protect a zip file? Either way, wonder no longer. We’re ready to explore everything you need to know about how to make, create, zip, and password protect zip files on Mac. Let’s dive in and get started. Once you know how to zip a file, it’s a quick and easy way to bundle casual, low-stakes materials and send them off to friends, family members, or coworkers. To zip a file, all you have to do is highlight the documents or images you wish to bundle and right click > “Compress [#] items”. Then, rename the zip file to your heart’s content. Here’s where things get more complicated. Let’s say these adorable dogs are top-secret, and must be password protected. While it’s a snap to password protect PDF documents after you’ve created them, you have to simultaneously create and password protect a zip file. There’s an easy way and a hard way to create and password protect a zip file. First, we’ll walkthrough the hard way, for kicks. If you’d prefer to skip directly to the easy way (recommended), feel free to skip this section and scroll on down to the next section! 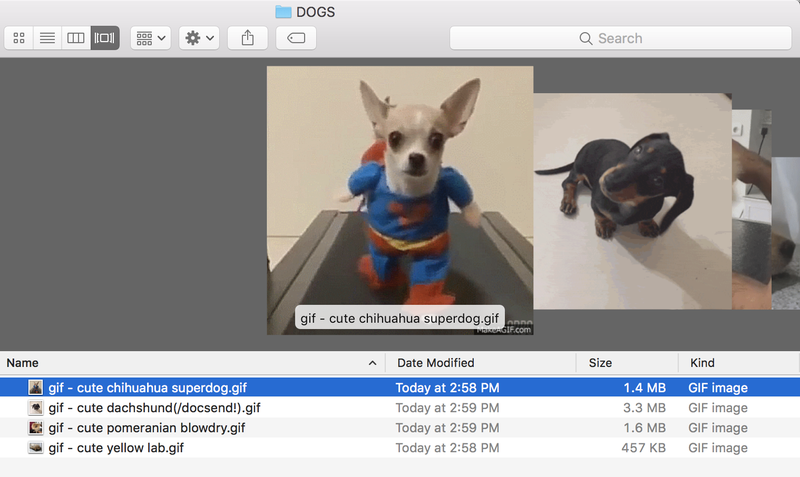 So, anyway, let’s start back at the beginning—you’ve got your dog gif (or your comparable file) and you want to compress it into a password protected zip file. First, open your Terminal app—this should be located in your Applications folder. When you open Terminal to create your secure zip file, you should be presented with a white box with text similar to that displayed in the following screenshot. Next up? Set the destination of the file you wish to compress into a .zip. You can most easily start doing this by typing cd into the second line of text. 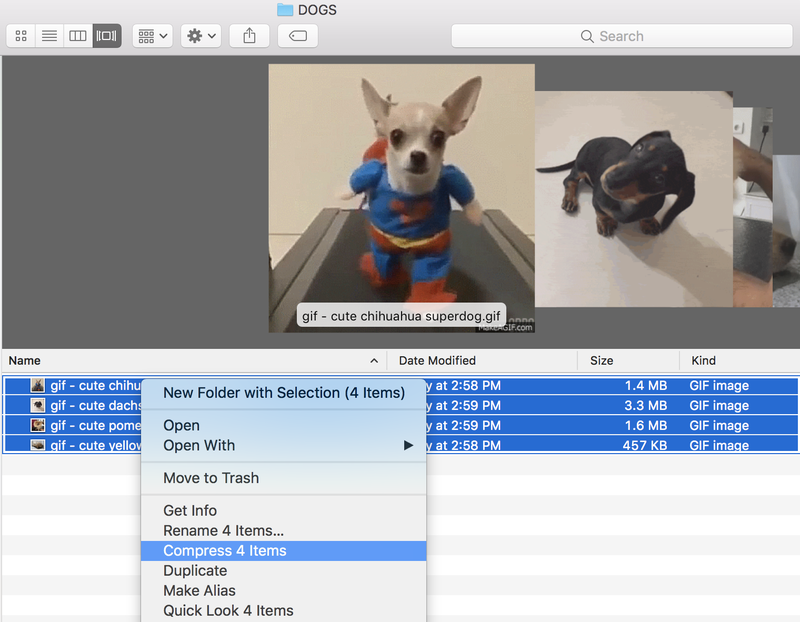 You’ll then want to open the folder containing the file you’re zipping (for example, Documents or Desktop or Downloads—or, in this case, DOGS). Drag the blue folder icon next to the name into the space on the line next to cd. Next, copy the following text and change the names of the .zip and .gif to the desired name of your .zip file and the existing name of the existing file. For this demonstration, I’m using a gif, so I’m using the file extension .gif in the Terminal command—you’ll want to edit this accordingly. Then, paste the command into the next open line in Terminal and hit enter. If nothing’s gone awry, you should be prompted with requests to enter and verify your password for the password protected zip file. Enter the requested twice and press enter each time. And you’re done! Phew—surprisingly convoluted, right? Got multiple files you want to send? That would involve either repeating this process for each individual file or modifying Terminal entry appropriately. Let’s be real: Even the most seasoned Terminal wizards don’t have time in their lives to password protect zip files in such a convoluted and non-scalable way. In fact, it’s worth noting that password protected zip files aren’t even secure—they’re only as secure as the password, which is likely floating in an email or text message to the intended recipient. In this scenario, the stakes are low. I wish hackers were only after cute photos of yellow labs. But what if you’re converting your bank information or a high-stakes business contract into a password protected zip to share with stakeholders? By ditching Terminal (and the zip file entirely) and sharing these materials with DocSend, you’ll be able to not only implement top-notch security measures (password protection, whitelisting, viewer verification—oh my! ), but also track engagement with these materials. In other words, you’ll be able to keep your sensitive information under lock and key, while also making sure intended recipients—and only intended recipients—have received and opened your materials. In fact, if you’re looking to share a group of these files securely, and don’t want to deal with the hassle of creating individual links in DocSend, you can use our snazzy deal room feature, Spaces. With Spaces, you can share business-critical materials securely and intelligently—and at scale. If all of this sounds intuitive (it should), you can click here to learn more and get started with DocSend for free. If you have any questions, our support team is always happy to help. We’ve all been there: It’s the end of a long week, you’ve got exciting weekend plans, and the last thing you need is a disastrous email typo or snafu.